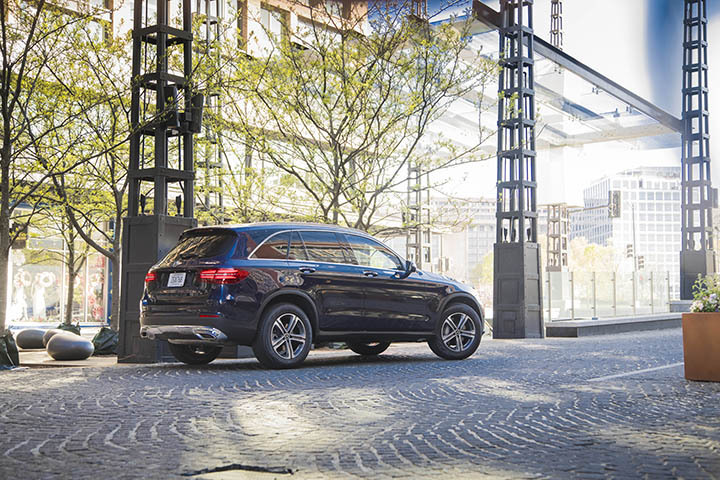 Modernity, strength and versatility, that is what the design of the GLC 350e embodies. The design idiom follows the design philosophy of sensual purity and illustrates the carefully considered interplay of aesthetics, agility and intelligence. The appearance is sportier overall, the chrome elements now run from the front to the rear end as standard. The distinctive lines, muscularly sculpted surfaces and distinctive details ensure a strong off-road character. The front end gives the impression of emotion, presence and dominance at the very first glance. This design message is made particularly memorable by the standard-fit LED High-Performance headlamps with the torch-design daytime running lights, as well as by the heavily contoured radiator grille with the dynamically shaped double louvres and the diamond lattice. The athletic character continues in the rear view with the completely revised bumper and exhaust tips. The redesigned full LED tail lamps also ensure an unmistakable light signature with the hallmark blocks of the Mercedes-Benz SUVs in backlit edge-light specification. All in all, the design idiom of the rear end underscores the powerful character of the GLC 350e generation, not least because of the design of the bumper with the exhaust tips and the chromed skid plate sporting the typical SUV design. 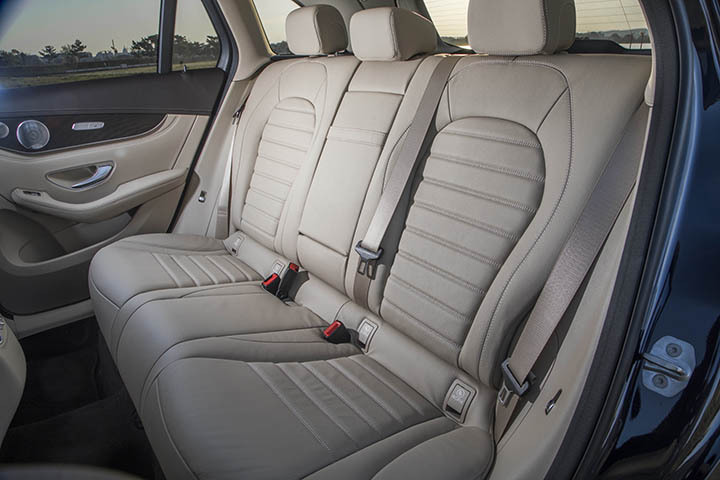 Refined materials, precision workmanship and flowing shapes that is what characterises the interior of the GLC 350e. It is characterised by flowing surfaces in connection with clear lines and irresistible proportions. The interior of the Base Line is finished in black. The centre console features an elegant trim component, which is available in piano lacquer finish or the two new wood surface finishes open-pore ash wood and walnut. The lines of the noble-wood veneers in the centre console exemplify supreme craftsmanship. Well thought-out, ergonomic, comfortable these guidelines governed the advancement of the operating and display concepts used in the GLC. The focus is on the interaction with the vehicle and its functions through gestures, touch or the voice control system. This is made possible by the latest telematics generation of the Mercedes-Benz User Experience, which is characterised by intuitive logic and a wide range of operating options. Overall, the interplay of the touchscreen displays, the navigation with augmented reality, the intelligent voice control and the user interface sets real standards. The revised voice control system makes operation even more convenient and natural. By voice command, the driver can have the system read out text messages, operate the audio systems or access vehicle functions such as the climate control system, for example. The system requires no memorised commands the user has the freedom to phrase the desired destination address or the question about the weather report off-the-cuff. What else is possible now: activating the voice control with the Hey Mercedes prompt. The talk button on the steering wheel is additionally available for this purpose. 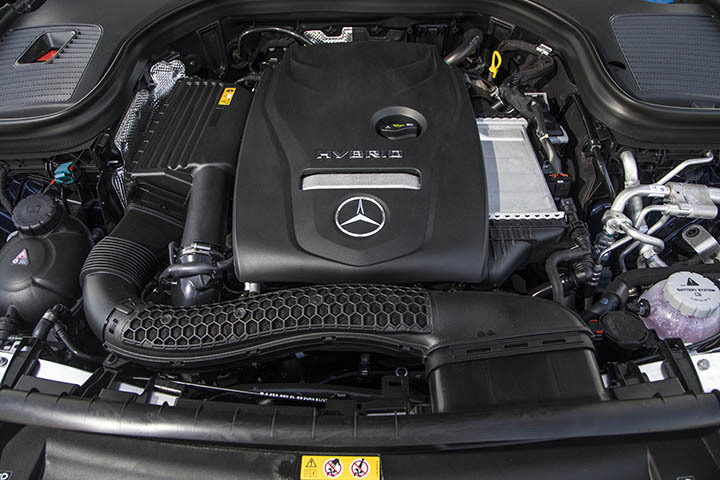 Under the hood the GLC 350e is powered by a 2.0-liter turbocharged inline-four engine with an 85 kW electric motor. The combined horsepower is rated at 315, and the combined torque measures 413 lb-ft of torque; The hybrid system’s is geared through a 7G-TRONIC seven-speed automatic transmission with overdrive and paddle shifters. An SUV that lives up to its name, as usual, the GLC is convincing on almost any type of ground and in the most adverse weather conditions. The DYNAMIC SELECT system with expanded functions responds to the individual requests of the driver regarding the handling and the requirements posed by the road conditions. The 4MATIC all-wheel drive has also been newly developed from the ground up. The three-stage design of ESP with a wider spread now offers even more dynamics in the “Sport” and “Sport +” drive modes, once again proving the versatility of the GLC. With its distinctive appearance, new operating system, innovative driver assistance systems, the GLC 350e offers the best from the world of Mercedes-Benz. The exterior design captivates with its wide and sporty visual appearance. The interior combines luxury and user-friendliness in an uncompromising way with a larger display. 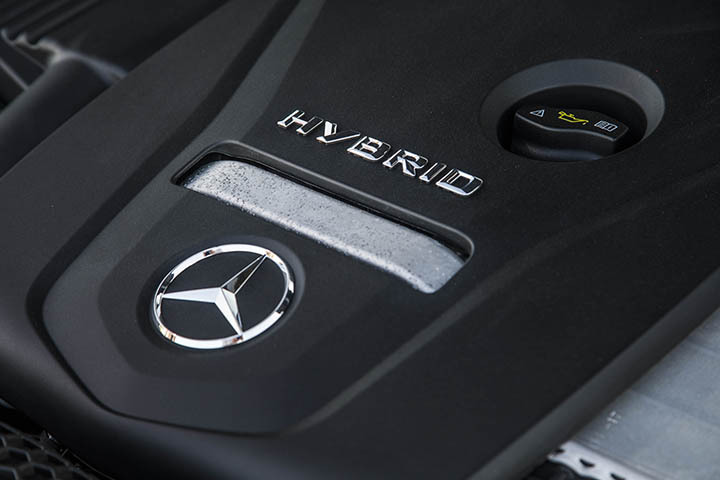 In addition, the latest generation of the Mercedes-Benz User Experience multimedia system impresses with intuitive and versatile operating options such as touch and the optimized Voice Control system. 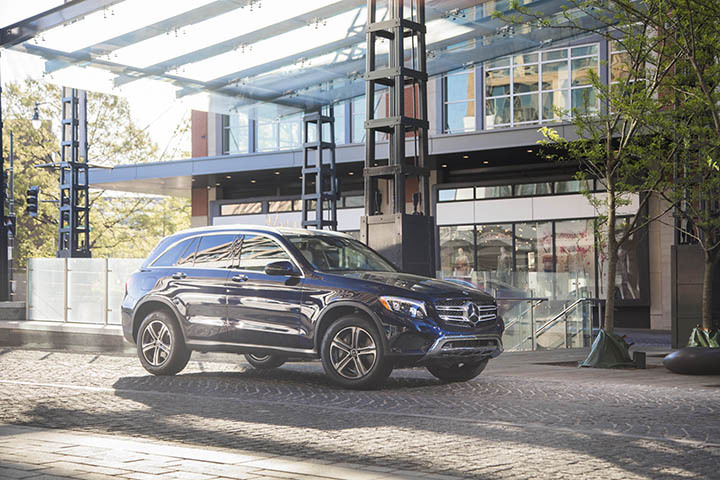 The 2019 Mercedes-Benz GLC 350e 4MATIC EQ Power starts at $50,650.00, the one I drove included, Iridium Silver Metallic Exterior Paint ($700.00), Heated & Ventilated Front Seats ($450.00), Panorama Roof ($1,500.00), Heated Steering Wheel ($250.00), Air Body Control Air Suspension ($1,900.00), Burmester Surround Sound System ($850.00), Heat and Noise Insulating Front-Side Dual Pane Glass ($150.00), Heated Rear Seats ($580.00), LED Ambien Interior Lighting ($310.00), Premium Package ($700.00), Leather Seating Package ($2,050.00), Exterior Lighting Package ($800.00), Intelligent Hybrid Navigation and Multimedia Package ($2,200.00), AMG Line ($1,600.00), Night Package ($300.00), Parking Assistant Package ($1,200.00), Driver Assistant Package ($2,250.00), and it came in at $69,545.00 including Destination and Delivery ($995.00).